One of the best features of the WD My Net Wifi Range Extender: it’s incredibly easy to set up — if you know how. But don’t look to the instructions included in the box to offer any guidance. Inexplicably, said instructions don’t provide the most essential explanation even though that could be done with a simple paragraph of text. Here’s all you have to do: Plug in and turn on the Range Extender and then go to the available wifi networks on your computer. You’ll see one with an SSID named WDRangeExtender. Select it and then go to any internet page (or http://192.168.1.230 if that doesn’t work). Then follow the onscreen instructions. You’ll be asked to choose the network that you want to extend and to type in its password (if there is one). That’s it! 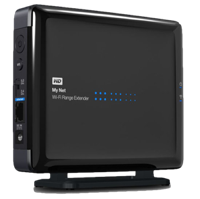 If you run into trouble, Western Digital has an excellent trouble shooting guide available online. 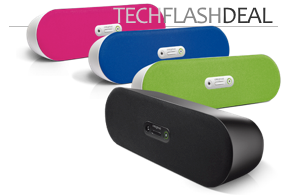 Because the setup is done wirelessly via a browser, no cords or cables are required. The My Net Range Extender is also system agnostic. It works with a Mac and PC. You can also do the set-up on any smartphone or tablet with a browser. In case you are curious, the included instructions suggest you connect the Ranger Extender by pairing the device to your wifi signal using WPA buttons. This didn’t work for us nor does it seem to for most people. Once you’ve completed the set-up process, handy LEDs on the side of the Range Extender will light up. The more dots that are lit the stronger the signal it’s receiving (and thus the stronger the signal being sent out). These lights remove the guess work from the decision of where to place the Range Extender for optimum performance. 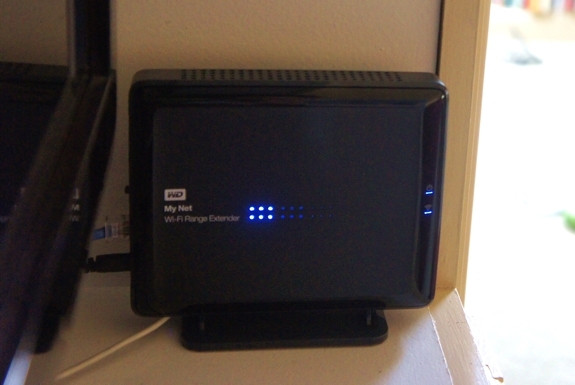 The WD My Net Wifi Range Extender works! It gave us three or four-bar coverage around our entire house in addition to extending two bars of wifi to the back patio. We were able to get one bar as far as 80 feet (25 meters) from the signal source. Others have reported getting a useable signal up to 150 feet away, but with so many factors that can effect individual results we suggest setting your expectations lower than that. The WD My Net Wifi Range Extender even looks good sitting on a shelf. And at a mere $35, it is hard to go wrong. « Nokia Lumia 1020: The Best Smartphone Camera? Thanks! We just bought one for our house, too. Great recommendation.